A prefix is a part of a word that is added to the beginning of another word to change its meaning. These syllables aren't usually words on their own, but they are very important when it comes to understanding new words in English. Many prefixes have to do with numbers and quantities. Learning to recognize these number prefixes and memorizing their meanings will make it easier to figure out what unfamiliar words mean. If you already know the root word, you can often decode the definition by putting the meaning of the prefix and root word together. When you are able to commit a numerical prefix to memory, it becomes much easier to decipher the meaning of unfamiliar words that use that prefix. If you know that "tri" represents the number three, then it's easy to figure out that "tricycle" is something that has three wheels. Listed below are several of the most common number prefixes, along with the number they represent and some example words that contain that numerical prefix. Note that some numbers have more than one prefix. This is because English draws from both Greek and Latin influences, and those languages have two different numbering systems - both of which are used for English prefixes. In the chart above, the Latin prefix is always listed above the Greek one when both are in use. For example, "quint" as in "quintuplets" (a group of five babies born to the same mother at once) is derived from the Greek. By contrast, "penta" as in "pentagon" (a five-sided polygon) is derived from the Latin. Memorizing number prefixes will help you quickly figure out what new words mean, particularly when it comes to math and science applications. The metric system also makes use of many Latin prefixes to express extremely large or extremely small quantities; you can read more about metric prefixes here. 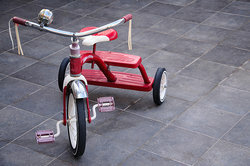 The "tri" in "tricycle" means "three"
"Number and Quantity Prefixes." YourDictionary, n.d. Web. 18 April 2019. <https://examples.yourdictionary.com/reference/examples/number-and-quantity-prefixes.html>. A prefix is a part of a word that is added to the beginning of another word to change its meaning. These syllables aren't usually words on their own, but they are very important when it comes to understanding new words in English.Many prefixes have to do with numbers and quantities. Learning to recognize these number prefixes and memorizing their meanings will make it easier to figure out what unfamiliar words mean. If you already know the root word, you can often decode the definition by putting the meaning of the prefix and root word together.